Salzburg is situated at the heart of Europe and, thanks to optimal infrastructure, is easy to get to from all directions. No matter whether you will be arriving by car, plane or public transport, here you will find the information you need to get to the Gersberg Alm. Thanks to our great transport connections and plenty of parking, the hotel is easy to reach no matter how you plan on travelling. Exit the A1 motorway at the Thalgau exit (exit 274). Continue driving towards Hof. In Hof, turn onto the B158 towards Salzburg. Take the junction onto the L108, the Gaisberger Landesstrasse in Guggenthal. Continue on this street and you will reach your destination in just a few minutes. Exit the A1 motorway at the Salzburg Nord exit (exit 288). From here follow the hotel guide system and signs – be sure to follow the green "Hotel Route" signs. We recommend entering "Guggenthal" as the destination for navigation systems. Please note Austria's winter tyre requirements: these requirements apply from 1 November until 15 April with the explicit wording "in winter conditions", which applies when there is snow, ice or slush. Every day, numerous direct domestic and international flights land at Salzburg's W. A. Mozart Airport, making the city well-connected to the rest of the world. 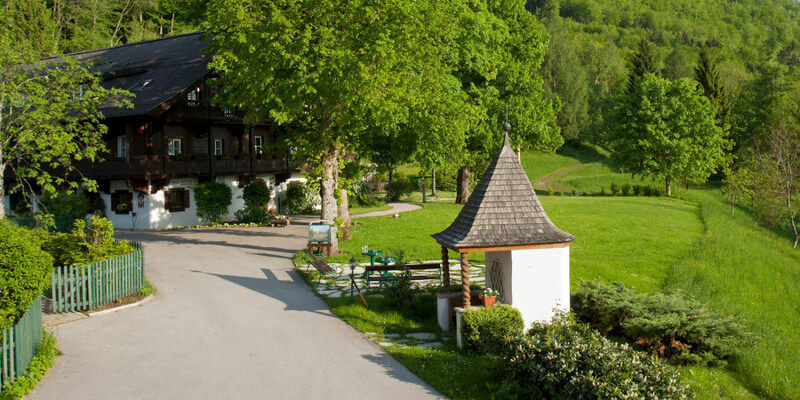 A taxi will safely and easily deliver you from the airport to the Gersberg Alm. The Salzburg Hauptbahnhof (main station) with connections to Austria, Germany and Italy is just a short drive from the Gersberg Alm. Will you require a taxi for your arrival? Simply let us know – we will be happy to organise a taxi that will take you straight to our hotel. We look forward to welcoming you!